A good photographer friend of mine is quite frustrated — rightfully so — with the native Photos app on the iPad. He’s been importing photos into his iPad using the iPad Camera Connection Kit and was hoping to create photo albums from his shoot to show to his clients. Of course the Photos apps is not really designed for photo professionals. It is designed around the needs of the point-n-shoot camera family photographer — the ones who only bring out the camera for family events but leave the images on the camera for months. Even if the family photographer has “upgraded” to a DSLR they will most likely be shooting JPEG. Alright… I am trying to import photos from my camera to view on the iPad. Simple process — connect camera to iPad camera card and import. Unfortunately, when I am shooting RAW it imports in some format that other slide show type programs do not understand. Secondly, it will only show the imported files as they were imported to a specific album.. what do I mean? well when I do an import of 10 pics then another import of 10 pics they are in separate albums. 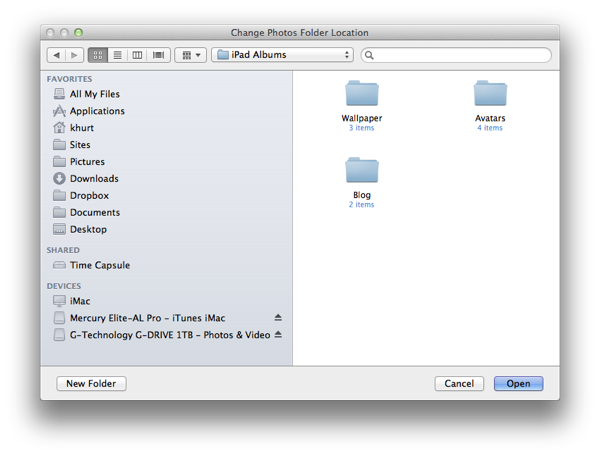 This does not allow them to be show in a single slide show… can only show one folder at a time…. I cannot seem to figure out how to combine the folders. I can copy and paste a single shot into an email but not into another album. I am trying to set up a slide show of the wedding/getting ready shots for the reception. I am at wits end with this one. I even purchased the $15 Portfolio program in hopes that it would work… however, it cannot read the imported RAW files from the stupid, individual albums… UGH. Yep. That sounds very frustrating. When you import into the Photos app on the iPad it imports in the native RAW format of the camera. Unless the other app is written — that’s the developers choice — to read from the Photos album the user will be quite frustrated. Put another way, if I import photos into Adobe Lightroom as Nikon RAW (NEF) a program written to read Canon RAW won’t be able to read it. Most point-n-shoot cameras shoot in JPEG which any iPad photo app can read. The iPad Camera Connection remember was designed to be easy for the general and novice photographer. So how do we solve my friend’s problem? 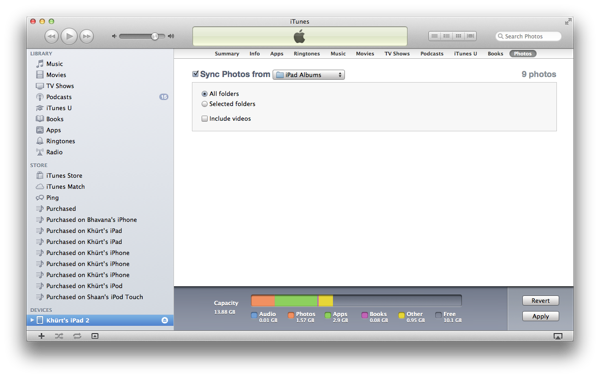 iTunes has a feature that allow the user to sync photos to the iPad (or any iOS device) from a folder. We’ll use that feature to create albums on the iPad. First create a folder on your computer called “iPad Albums”. 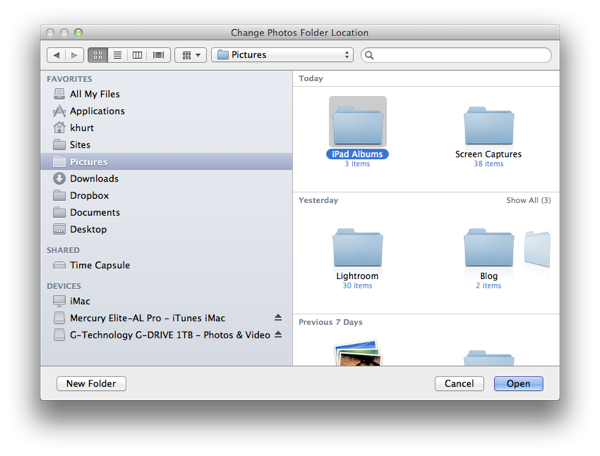 It can actually be any name and be located anywhere but on my Mac I created it inside the “Photos” folder. Create a number of sub folders containing the photos you want to sync. Now, connect your iPad to iTunes. 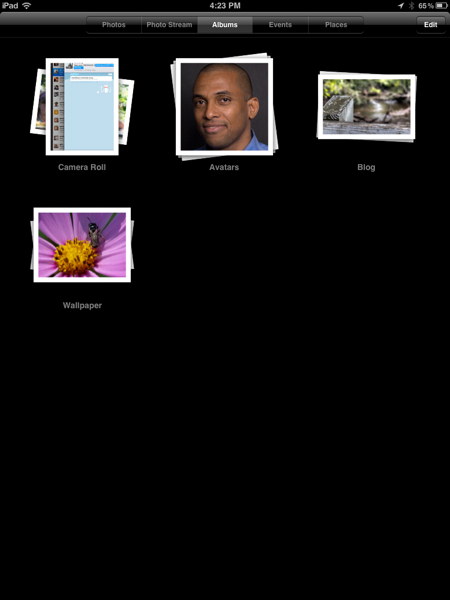 Select the iPad in the left pane and then select the Photos tab. Select the *Sync Photos From* drop down and then choose the folder you created earlier. You can chose to sync all the sub folders or just specific ones. Once you click sync, iTunes will create albums in the Photos app with the names of the folders you created. These albums are kept in sync. Are there any hints/tips that you would like to see? I love writing these articles. @ShutterBugGeek Are there any iPad/iPhone or Mac tips you would like to see covered here? I do some of my best work on “assignment”. Hi! Thank you for the helpful article! I would also like to know if there is any other way to select all photos in a single album except the two-fingers technique. I don’t see a way to do that. Apple didn’t fix this in iOS 6.